BEVERLEA WALZ PHOTO Legion Commander Dave Clark raising Old Glory — with some help from his friends— at Veterans Day services Saturday in the Center. Fifty Boy Scouts, Girl Scouts and parents visited the Intrepid Sea, Air and Space Museum on November 19. 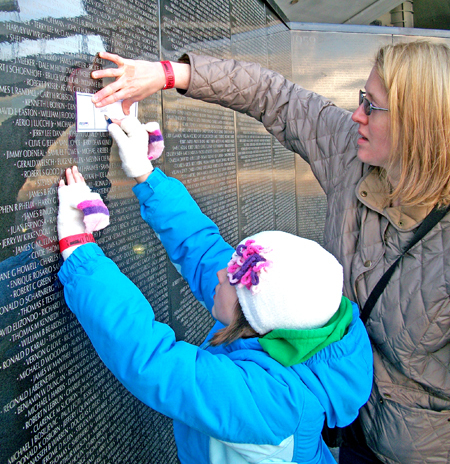 With a little help from her mother, Meredith, Camryn Page was able to locate the name of her great-uncle, Frank L. Cass, on the traveling Vietnam Memorial Wall and make a rubbing. Scouts explored a submarine, visited planes and helicopters on the flight deck, and as part of earning their patch, interviewed veterans and servicemen and women on site. The program was made possible with support from the Shelter Island Educational Foundation.